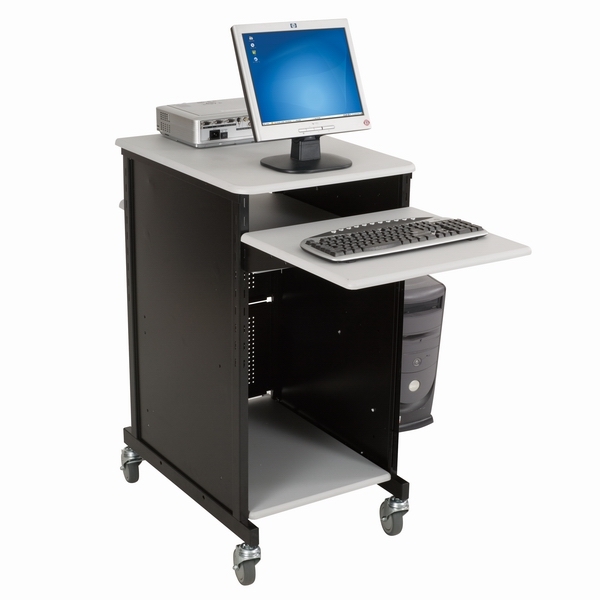 This Wide Presentation Projector Cart is an excellent choice for presentations that need more space. Two 18"Wx24 3/4"D wing shelves provide additional space for document cameras, laptops and other presentation materials. Wing shelves remove quickly and easily without tools to get this wide presentation cart through doorways. 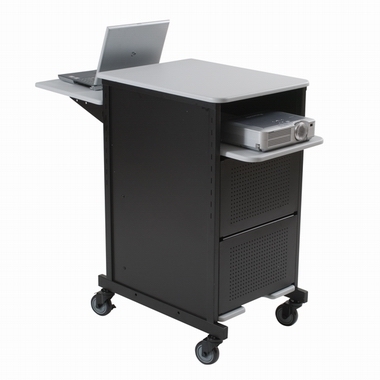 The Wide Presentation Cart features sturdy scratch resistant black powder coated steel construction with a ventilated rear panel and side CPU holder with gray laminate shelves. Adjustable shelf adjusts to level with top of cart for a larger surface or lowers down as a keyboard or laptop shelf. Integrated projector shelf leaves the top of the unit avalible for a monitor, document camera or other presentation materials. Moves easily on four large standard size casters, two locking. 4 and 7 outlet electrical assemblies avalible.